Introducing the new, fully redesigned 2020 Corolla at Le Mieux Toyota! The 2020 Corolla boasts new aerodynamic exterior styling and a spacious, high-end cabin with a variety of premium features. With a sharp look, impressive handling and the latest driver assist technologies, the 2020 Toyota Corolla is as equipped as ever to take on the competition. That said, what are the key differences between the 2020 and 2019 Toyota Corolla and which model is right for you? Overall, the 2020 vs. 2019 Toyota Corolla are drastically different in terms of handling and style. The two models have very distinctly different exteriors, cabins and engines. Not only that, but the 12th generation 2020 Toyota Corolla also adds hybrid and hatchbacks to the lineup. 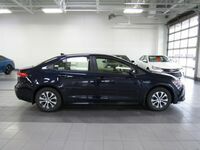 Introducing the new 2020 Corolla at Le Mieux Toyota in Green Bay, WI! The 2020 Corolla makes a variety of features standard, including Toyota Safety Sense 2.0, an Entune 3.0 Audio system with Wi-Fi Connect, Amazon Alexa, Apple CarPlay compatibility and much more. For 2020, the Toyota Corolla is built on a new platform, called the TNGA, which is used on both the sedan and hatchback body styles. Differences aside, the 2020 and 2019 Toyota Corolla share a variety of entertainment, convenience and driver assist technologies. In fact, the base L on both models is standard with Bluetooth, a six-speaker sound system, adaptive cruise control, a 60/40-split folding rear seat and much more. For 2020, the Toyota Corolla L builds on that list of equipment and adds a larger touchscreen, advanced safety technologies, a Wi-Fi hotspot, Toyota’s Safety Connect emergency communications and Apple CarPlay. We invite you to see all that the 2020 and 2019 Toyota Corolla models are capable of with a test drive at Le Mieux Toyota. Here you will find a great selection of vehicles and a helpful team of experts who can answer any questions you might have. Stop by and see us today! Interested in a 2020 Toyota Corolla?